Will we ever see another Bradman? Test cricket has been played for 140 years, and Sir Donald Bradman’s Test batting average is 38.97 points better than that of Graeme Pollock, who has the second best. Pollock is 0.14 runs ahead of George Headley in third, and the margins after that are 0.10, 0.55, 0.95, 0.56 and 0.06. The message is not quite so clear for the First Class game. Here Bradman is a mere 23.50 runs clear of Vijay Merchant. The first Indian master is 1.78 ahead of Headley, followed by distances of 2.40, 2.28, 0.19, 1.89 and 1.86. Two closely related questions are often asked; why was Bradman so much more successful at scoring runs than anyone before or since, and will we ever see his like again? David Frith echoed the thoughts of many when he wrote in his obituary of the great man; in his lifetime nobody matched his dominance or his staggering figures. And while it may be foolhardy to suppose anything is forever in cricket, it seems certain nobody ever will. Don Bradman was not one in a million. He was much rarer than that. Bradman hailed from Bowral, eighty odd miles from Sydney. He only ever played three cricket matches at school. The first was when he was 11. The match was played on a football pitch and, coming into bat on a hat trick, Bradman was unbeaten on 55 at the end of the innings. A year later he played on a matting wicket and scored his first century, an unbeaten 115 out of 156. His last innings at school was 72 not out. Like many of us Bradman played his first game of club cricket when his side were a man short. His uncle was captain of the Bowral side and a 13 year old Bradman was invited to game to look after the scorebook. As it was he found himself, still in short trousers and with a full size bat, going in at number ten. At the end of the innings he was unbeaten on 37. The following weekend he was sent in to open and was not out again, this time for 29. When Bradman left school at 14 he had only ever batted those five times, and scored 308 runs without being dismissed even once. For a while the young Bradman concentrated on tennis and it was the back end of the summer of 1924/25 before he played cricket again for Bowral. Initially he seemed to be reduced to the rank of a mere mortal, dismissed first ball in his opening innings and doing little better in the second, before scoring 66 in a semi-final in the third. After playing in just eight organised cricket matches in his life Bradman decided to devote himself to the game and he played a full season of club cricket in 1925/26. He batted 21 times and scored 1,381 runs at 101.38, the sort of mark that in years to come would be described as ‘Bradmanesque’. The youngster was noticed and by December 1927 the 19 year old was making his First Class debut against South Australia. He made a century of course, and never looked back. Other than two days Test cricket when he was 12 Bradman had never seen First Class cricket played prior to his debut, and he had never received any formal coaching whatsoever. The story of how Bradman honed his skills is a well known one. In the absence of any of his peers living close to him he had to conjure up his own pastimes. At his home was an 800 gallon water tank located on a round brick surround. The tank and stand were located on a cement floor. The area was enclosed on three sides and roofed over so rain was not a problem. The object of his exercise was for Bradman to throw a golf ball at the stand and then hit the rebound with a small stump, and he would play the game for hours on end. The striking of that golf ball with the stump was not, by definition, batting practice. But what it did do was to develop and finely tune the skills that batsmen use. The narrow stump, its convex hitting area and the small ball all forced Bradman to watch the ball intently and apply all the concentration he could muster. The golf ball bounced quickly from the stand, and picked up speed from the cement floor. There were only fractions of seconds for Bradman to judge the line, length, speed, flight and pace of the ball, and to select the correct shot. In that respect there were forfeits, Bradman having devised a series of modes of dismissal depending on where the golf ball ended up. So he had to co-ordinate the pick up of the stump and his body and feet movement to ensure the ball went where he wanted it to. In terms of how difficult the challenge was according to Irving Rosenwater’s biography of Bradman he was satisfied if he could succeed in striking the golf ball 75% of the time. When Bradman did pick up a bat rather than a stump his approach was far from orthodox. The basic coaching texts will tell you that the inverted Vs formed by the thumbs and first fingers of each hand should line up between the splice and the outside edge of the bat. For Bradman the Vs lined up with the splice and the face of the bat was closed as he prepared to face the bowler. 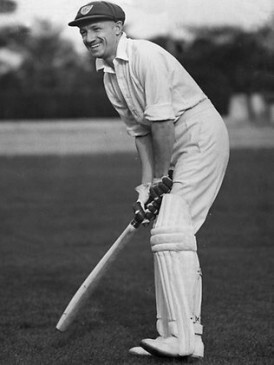 Jack Fingleton spent a good deal of time batting at the other end to Bradman, and he described the stance as unique. His bat touched the ground between his feet, not behind them like every other batsman and photograph I have seen. He stood perfectly still as the bowler approached, the end of his bat did not act as an escape conductor for energy with that nervous tap, tap, tap on the pitch so common to most batsmen as the bowler runs into deliver the ball. John Arlott was a young man when he first saw Bradman and wrote, he stood at the crease perfectly immobile until the ball was on its way, then his steps flowed like quicksilver out of trouble or into position to attack . At the other end of the age and experience spectrum Plum Warner’s words were, it is strikingly apparent how absolutely still Bradman stands until the ball is halfway down the pitch. There follows a lightning movement of his feet and the bat, and the ball crashes into the crowd. Conventional wisdom dictated that the pickup should be straight back, the ideal preparation for the straight batted defensive stroke. That wasn’t the Bradman way however. Bradman’s pick up was in the direction of second slip, or point according to Godfrey Evans who saw plenty of him during the 1946/47 and 1948 Ashes series. Whatever the exact position was there was a consensus that, after a circular ‘rotary’ motion, Bradman’s bat would end up coming down straight. How the bat should be picked up is an interesting question, and the answer has certainly evolved over time. England’s captain through much of the ‘Golden Age’, AC MacLaren, published a book about Jack Hobbs in 1926 in which he remarked approvingly on the straightness of Hobbs’ backlift. In 1936 another England captain, Douglas Jardine, wrote in an instructional book that; to keep on trying to lift the bat straight is the soundest and most valuable advice that can be given to any batsman. As a result of his lack of experience when Bradman came into the First Class game he simply didn’t realise that his approach to batting was anything unusual. Having arrived however that was soon pointed out to him. There was never any attempt to change the technique of such a gifted young batsman, but as time passed Bradman himself experimented with more orthodox methods, but never for any length of time. In 1958 Bradman himself produced a book on the game’s techniques, his classic The Art of Cricket. He conceded in the book that his own pick up was in the direction of second slip, but still acknowledged that the backlift should normally be straight. Eight years later Brian Close wrote Everyone would like to have a straight backlift, and that was the certainly the mantra that I heard time and again when I spent time with coaches back in the 1970s. Were there any other factors that set Bradman apart? He always maintained a high level of fitness, but he had more than his fair share of illness and injury. Even his eyesight was tested and found wanting in 1940, and one study in Adelaide came to the conclusion that his reactions were marginally slower than those of the average student, so Bradman was no superman. A point often made in relation to Bradman is that his mental strength set him apart from others. A look at his scores show there was no such thing as the ‘nervous nineties’ for him, and there was no satiating his appetite for runs, but I am not convinced this explains his primacy. When all is said and done Bradman batted for more than a day only a dozen times in his career, so in truth is not out on his own in the concentration stakes by any means. Whatever history might suggest it is difficult to come to a conclusion other than that there must have been, and indeed are, plenty of individuals around with at least the same potential to succeed as Bradman had. It is equally clear of course that no one has ever approached that standard and, with all due respect to Adam Voges, his current average does not accurately reflect his closeness in quality to Bradman, or indeed Graeme Pollock. It is sometimes said that another barrier to a new Bradman emerging must be the impossibility of the circumstances in which he was brought up ever being replicated. The fact he was brought up in a location where there were few boys of his own age meant that he had to make his own entertainment, and the stump/golf ball game must have been instrumental in developing his skills. That said many generations of children before Bradman and several afterwards had nothing like the competing demands on their time that the youth of today have, so perhaps that factor is not as significant as it at first seems. Bradman was a natural cricketer. He may have been unorthodox, but he batted in the way that felt right to him and the explanation often mooted as to why his like will not emerge in the future is that it is almost inconceivable in this day and age that a cricketer can get all the way to the First Class game without being coached. If a coach had caught Bradman whilst he was still a boy would he have tried to take him down the path of the coaching manual? I suspect the answer is almost certainly yes, but would it still be today? It is an interesting question. There is no doubt that coaching attitudes to individual foibles that work have been changing, as indeed has one of the basic tenets of coaching. Geoffrey Boycott’s technique could fairly be described as a paragon of orthodoxy, and in 2010 he wrote if you pick the bat up correctly it should go back towards first slip, and a very experienced coach, and CricketWeb veteran who we sadly see all too rarely on our discussion boards these days, told me I actively coach that the bat must not go back straight. The explanation that we give to the children is that if your bat is straight behind you then it’s going to get blocked off by your legs and pads when you attempt to go straight down, therefore leading to closing the face, playing into the legside and leading edges. In terms of the ethos of coaching Mr Pickup went on, it is interesting to look back at the way that coaching has changed in the fourteen years since I did my first coaching badge. The old ECB badges focused heavily on technical competence and skills; now the UKCC programme and the new pathways concentrate on how to coach and teach, rather than the specific technicalities. I can only speak for Oxfordshire’s programme, but the technical input we use with the younger end of the pathway focuses on ABC – “alignment, balance and completion”, and if they strike the ball cleanly and consistently then it’s not broke so don’t fix it! And the trend is gathering pace. Neil tells continued coaching is certainly heading towards a more individualised approach. There’s something called the Action Types Approach gathering traction. It talks about tailoring technique to the particular player. At its simplest, guys with big glutes will benefit from a wide stance and movements initiated in lower-body movement patterns. Smaller guys won’t …. people who “bat like keepers” and are nimble on their feet with low centres of gravity. Not following a rigid pattern does make coaching trickier of course. As Neil adds, all this could of course be more of a hindrance than a help to many recreational coaches. Those coaches I have spoken to who worked with children in the past, and who would fit Neil’s description as recreational coaches, seem agreed on the fact that in their time they would have encouraged orthodoxy above all else. Nowadays, with attitudes seemingly very different, it seems that the unusual and unconventional who succeed because of rather than in spite of their idiosyncrasies are not so quickly discouraged. So perhaps we will see another Bradman. To my mind the only man who can be compared with the Don is WG Grace. No one else has ever displayed the same degree of dominance over their peers as those two so with around seventy years or so between them their successor is now a little overdue. On the basis that amongst cricket coaches, as with many others, old habits die hard I wouldn’t be surprised if when he, or perhaps she, emerges they may well come again from an unconventional background, perhaps an Afghan refugee camp, where coaches are much rarer beasts than they are here, or maybe Oxfordshire, which is clearly an enlightened location.